Yogyakarta heritage building. Temples including cultural building heritage. Cultural heritage does not belong to all nations, but that of the entire human race. Heritage means "something handed down from the past, such as a tradition, birthright, or inherited traits." (TermWiki) or in Oxford Dictionary, written historical heritage : "traditions, and values ​​of a nation or state owned for many years and considered as an important part of their character". What is now Yogyakarta was the witness to the rise and fall of once glorious kingdoms in Java. Not surprisingly easy to find the ruins of old buildings here. 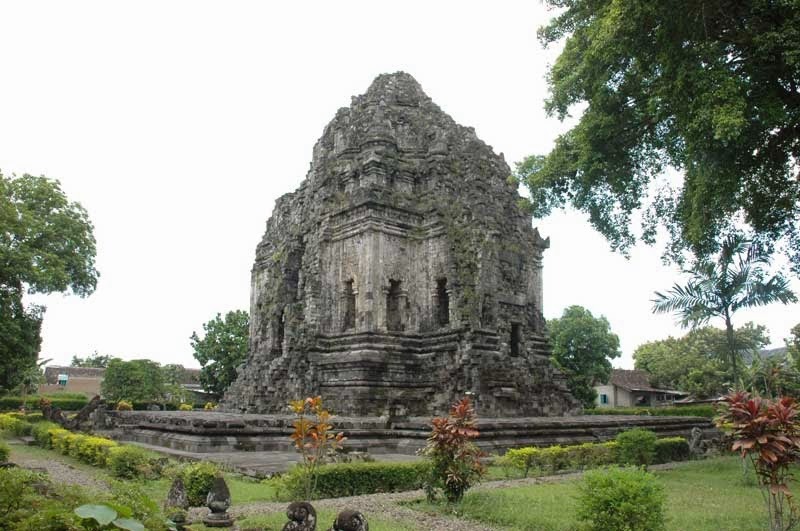 Heritage temples of Old Mataram Kingdom (8th - 10th century) can be found in many places in Yogyakarta and Central Java. The ruins and relics of the Islamic Mataram Kingdom (16th - 17th century) is in Kotagede. While the Kingdom of Yogyakarta, which lasted until the mid-20th century, left the Sultan Palace which is still functioning today. With the above definition, then I conclude as Yogyakarta Heritage are treasures of cultural heritage material that deserves to be preserved in various ways. One is to make the material culture favored by tourists and travelers to get the value or impression that will make scrolling effect in the field of tourism industry. Heritage-based tourist destination in Yogyakarta quite a lot of material, you can select among which I mention below. What the most famous places in Java as a tourism destination? It's definitely Borobudur Temple. Borobudur was the magnificent world cultural heritage site. A huge 34,5 meter high and 123 meter square widely of rock was built by king of Ancient Mataram, King Samaratungga of Syailendra Dynasty. Borobudur located in Central Java, one hours away from Jogjakarta city. Borobudur built as for Buddhists's ritual, there are 1460 reliefs carved from bottom to top about the way being a buddha. It's a mountain statue with 10 level of high that represent as 10 ways of Boddhisatwa wisdom or Hhumtcambharabudara. Rocks constructed temple, jointed each other from botom to the top. The United Nations Educational, Scientific and Cultural Organization has designated Borobudur Temple also Prambanan Temple meet the criteria as world cultural heritage. With this historical value as monumental cultural heritage that can not be valued in money, is it expensive for foreign ticket price USD 20 per-person for visit Borobudur Temple ? No....You mean has contributed to participation in preserving the world's cultural heritage. Mendut Temple. Built for worship, Mendut Temple is dedicated to Buddha Sakyamuni with a pantheon of bodhisattva. Mendut is the oldest of the three temples including Pawon and Borobudur. Cakyamuni Dyani Buddha statue in the middle of sitting with both feet angled down and the attitude of the hand turning the wheel of dharma. Carved out of stone intact with high accuracy. The Karang Tengah inscription, the temple was built and finished during the reign of King Indra of Sailendra dynasty. The inscription dated 824 AD mentioned that King Indra of Sailendra has built a sacred building named Venuvana which means ''bamboo forest''. Dutch archaeologist JG de Casparis has connected the temple mentioned in Karang Tengah inscription with Mendut temple. 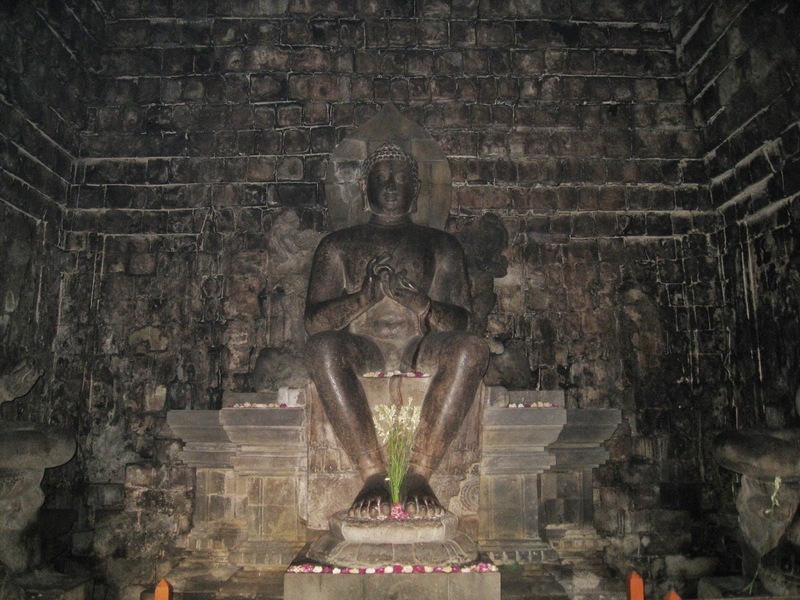 In the chamber, you can see three big statues enclosed in the square-shaped temple: Sakyamuni (Sitting in cross legged pose with dharma cakra mudra position ; turning the wheel of dharma hand gesture), Awalokiteswara (A bodhi satwa as a human helper), and Maitreya (The savior of humans for the future). Prambanan Temple. The building was built in 850th century by a king of the dynasty of Sanjaya. By discovery of writing the name of the temple "Rakai Pikatan" the opinion that this temple was built by Rakai Pikatan who later solved by Rakai Balitung based stone inscription 856 M "Inscription Siwargrartha" as a political manifesto to affirm its position as a great king. It's called Candi Prambanan. A Hollander, name C.A. Lons, found Prambanan Temple in 1733. First he saw black square rocks at the soil, and then started to clean up and moving the rock one by one. Oudheidkundige Dienst, a Dutch Archeological Authority, had designed more systematic system to install the rocks as the same with the original part. 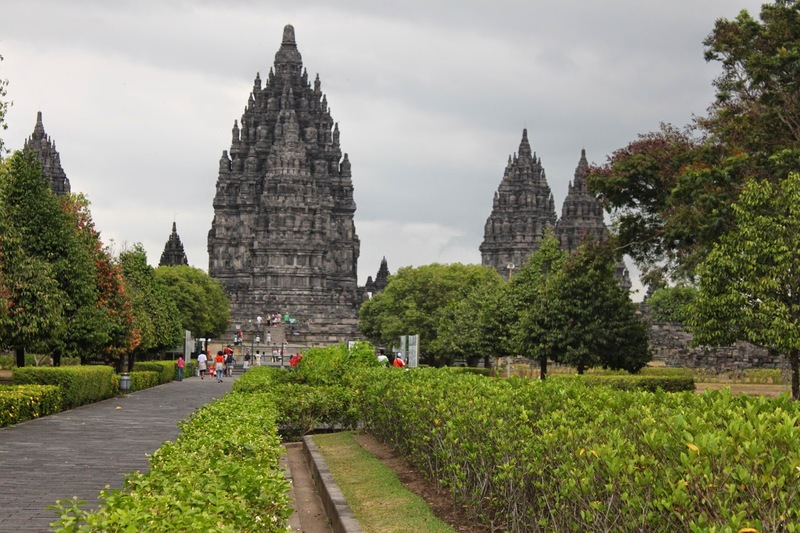 47 meter high, 8 main candi and 250 little candi, made Prambanan Temple as the biggest Hindunese templei in South East Asia. From the air, the complex of Candi Prambanan configurates Mandala form, a square with points at the side of it, north, south, west and east. North point is sacred place for Batara Wisnu, God of Verve in Hindunese and at south point for Batara Brahma, God of Conceive in Hindunese. Sewu Temple. In 1960, archeologists found a stone epigraph located on the east side of Opak River, a long river where flows from north to south in Jogjakarta. The stone epigraph has numbered of the year 792. It is told about a building which is a sacred building for Manjusri, a Bodhisattva in Buddhism, called Manjus'ri Grha, a Sanskirt language, means Home of Manjusri. Manjusri means good luck, the most wisely Bodhisattva than the other. Based on Holy Bible of Buddhism, Manjusri is being a Bodhisattva for billions year, sits on the right side of Buddha Sakyamuni. The Sewu Temple built for Majusri. Ratu Boko Temple. Located in a hill, called Boko Hills, Istana Ratu Boko (Queen Boko Palace) has much more beautiful angle view than the other temple. 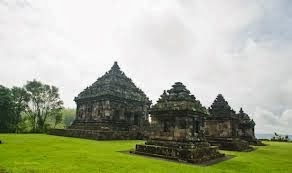 Many people called this site is Candi Boko because it is shaped like a temple. In the afternoon, the sunrise could seen in the gates of the palace. Sometimes, there are wild birds and animal pass away in the yard. A peacefull scene being a soul of the palace. The temple built in order to set a meditation place for the royal family. The temple has divided into four buildings: the middle, the east, the west and the south east. The middle are main gate-3 metres high, a yard, a burning temple, the paseban and the punden. The east are caves and sacred pools. The south east are the pendopo, the balai-balai, temples, sacred pools and the keputren. The west only rock hills. Plaosan Temple. Sri Maharaja Rakai Pikatan, leader of ancient mataram kingdom who ruled Central Java in 9th century, wished after his wedding with Pramudhawardhani that his dynasty would ruled for longest time than the other empire. He dream that glorious empire could be role-model for any empire southern Java. So he built a temple in northern Jogja, named Candi Plaosan, based on name the Plaosan Village Although Sri Maharaja Rakai Pikatan is Hindu, he built Plaosan Temple with a touch of Buddhism. The religion from his wife and his dynasty had influenced his masterpiece. There are 2 temples in the north side, named Candi Plaosan Lor, which has some Boddhisatva and woman goddess from Hinduism religion figure in the each stone wall. Inside each candi have 8 squares which separated into 2 sides, upper and below. And at the south side, there is Candi Plaosan Kidul which has 5 meter high structured by black square stone, looks heavy and strong. As the same of candi on north side, this temple also has 8 squares which has Boddhisatva relief is the center building. Sambisari Temple. Sambisari temple is very unique, it lies 6,5 meters bellow the ground level. Based on a geological research, this temple of 6 m was buried by an eruption of volcanic ash from Mount Merapi. Build for worship, Sambisari temple is a Hindu temple of 9th century that was built by a king of the dynasty of Sanjaya. The complex of temple limited by the walls encircle the total area of 50 x 48m. This temple consists of one main temple and 3 temple supporting temples (perwara). The main temple is facing west and took form of a square with size 13.65 meters x 13.65 meters. In the main temple room, there is a phallus-Yoni shows that this temple was build as the place for worshipping Siva. In the chamber, there are three statues, Agastya in the south side, Ganesha in the east side, and Durga in the north side. Sari Temple. This temple is correlated with Kalasan inscription (700 Saka/778 AD). The inscription mentions that the spiritual advisors of Syailendra dynasty suggested King Rakai Panangkaran to build a shrine and a monastery for Buddhist monks. Following the suggestion, the king built Kalasan temple to the worship of Dewi Tara Sari temple as a monastery for Buddhist monks. Sari temple was originally a building with two or even three floors. The upper floors served as storage of religious objects, while the lower floor was to accommodate religious activities such as teaching and learning, discussion, and so on. The wall of the temple is coated with vajralepa (bajralepa), similar to the wall of Kalasan temple is. That the temple is divided into two floors is already visible from the outside with the presence of projecting part like a belt around the temples body. The division becomes more apparent with the pillar arrangement along the wall of the lower floor and with niches along the wall of the second floor. This temple also proves that in the past there was an effort to unite people of different religions. The proof is that Panangkaran who was a Hindu built the Sari temple in response to the proposal of Buddhism monks. 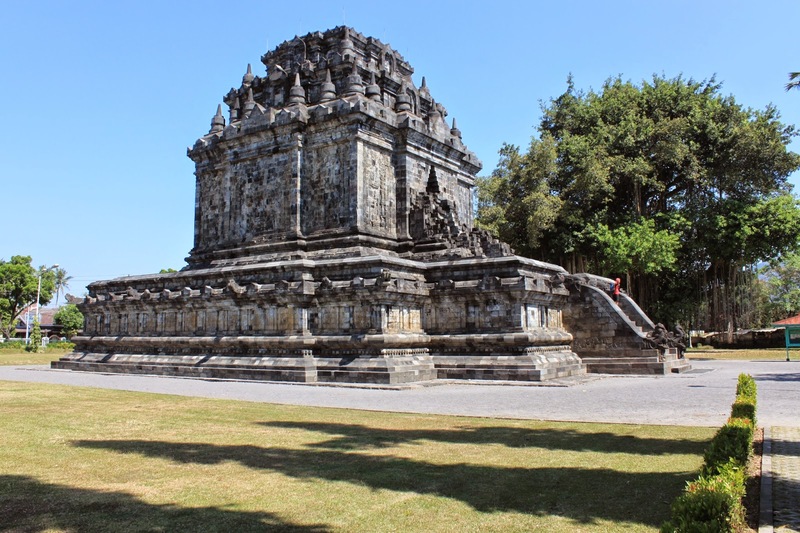 Kalasan Temple or also called Tara temple is the oldest Buddhism temple in Yogyakarta that was built by King Rakai Panangkaran from ancient mataram empire. To build a sacred building to worship Dewi Tara and a monastery for Buddhist monk, Rakai Panangkaran who is Hinduism was granted Kalasan village to Buddhism. It is estimated that the building is the Kalasan temple because of the presence of place inside the temple where a statue of Dewi Tara used to be placed. The monastery for Buddhist monk is Sari temple, located not far from Kalasan temple. Base on the year when the Kalasan inscription was written, it is estimated that Kalasan temple was built in year 778 AD. Ijo Temple is a temple located at the highest place among the rows of temples discovered around Yogyakarta that presents natural and cultural enchantment. Ijo (in Javanese language, this word means 'Green') temple with the background of Hindu that was built in the 10th century in the reign of the ancient Mataram. The temple complex comprises the main temple, Apit and Perwara temples. The main temple that has been completely renovated yet, is facing west. There are standing in line three smaller temples in front of it and assumed to do worships for Brahma, Wishnu and Siva. The main Temple is standing on the square base. The main entrance into the temple are in the central part. In the main temple building itself can be found a booth with the "Lingga-Yoni" in it. The unity of Lingga and Yoni symbolizes the fertility and the beginning of a life. Visiting this temple, you will find beautiful scenery that other temples do not have. When you look down to the west, you can enjoy green scenery from the trees and grasses on the hills and also you will see airplane taking off and landing at Adisutjipto International Airport. To the northeast, there are many houses that looked small due to the long distance. To the south, there are a cliff and green valley. Sultan Palace. A Living Museum of Javanese Culture and The Place Where The King of Jogja Lives. Keraton Kasultanan Ngayogyakarta Hadiningrat or now better known by the name of Yogyakarta Palace is the center of Javanese culture living museum that is in the Special Region Yogykarta (Daerah Istimewa Yogyakarta). 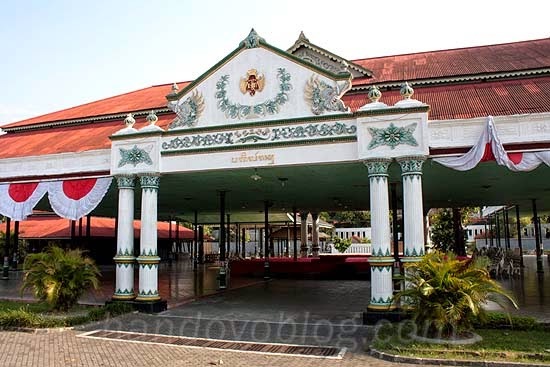 Not just becomes the place to live for the king and his family, the palace is also a main direction of cultural development of Java, as well as the flame guard of the culture. At this place tourists can learn and see directly on how the Javanese culture continues to live and be preserved. Yogyakarta Palace was built by Pangeran Mangkubumi (Prince Mangkubumi )in 1755, several months after the signing of the Perjanjian Giyanti (the Agreement Giyanti). Yogyakarta Palace will provide both valuable and memorable experience. The palace that became the center of an imaginary line connecting Parangtritis Beach and Mount Merapi. In XVIth century, The Dutch Colonial Government built the fortress, named as Rustenberg Fortress, means a place where The General Governor of The Dutch Colonial Government take a rest. It was built at the Sultan's ground. Every general governors used to stay in the fortress if they went to Jogjakarta. From 1765 - 1788, the fortress had been built again bigger and stronger, and then the Dutch Colonial Government changed its named ino Vredeburg Fortress until now. It means 'peace fortress'. 14. Kotagede Mosque. Built during Mataram Kingdom at 1640. Sultan Agung built the mosque together with local communities who are predominantly at Hindu and Buddhist. So it's no wonder when the mosque was also influenced by Hindu and Buddhist styles. Walking around the courtyard of the mosque you will see a difference in the wall surrounding the mosque building. There are stones like marble whose surface at one side and you can see the java script. A luxurious touch of the Royal Javanese Majesty. 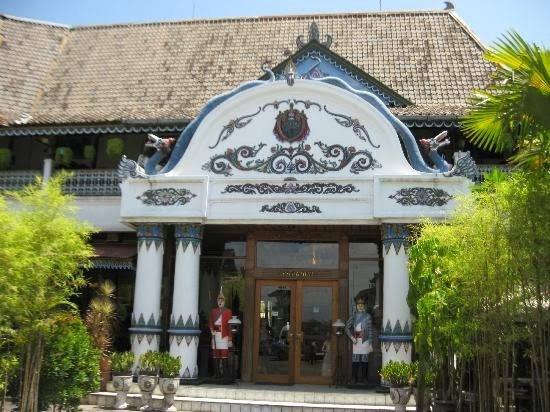 Sekar Kedhaton Restaurant is one of the largest restaurant in Yogyakarta is located in Kotagede. Each tourists visiting Yogyakarta both local and foreign tourists always want to know more closely about Kotagede. Sekar Kedhaton Restaurant stands disebuah buildings which have historical value is quite high. The building was founded in the 1800s by Mr. Prawiro Soewarno or greeting familiar with Mr. Tembong who a successful entrepreneur and famous Kotagede region. Sekar Kedhaton Restaurant is a very unique place , where guests can not only enjoy the best food is served , but here we can also find luxury and comfort ambiance with touches of grandeur thick Javanese ethnic decoration . We are tour operators in Yogyakarta, that experienced groundhandling tours for foreigners guest also domestic guest, so we hold tight the kind commitment to provide the best service for you who traveled to Yogyakarta, wheter you select our program YOGYAKARTA PRIVATE TOURS or YOGYAKARTA GROUP TOURS. So, don't take any longer time to contact us by email to : aswoto69(at)gmail.com. "I do appreciate you as a guest of Yogyakarta, so if you agree to use our services in terms of transportation while in Yogyakarta, we do not require you to pay a deposit (down payment) with bank transfered as a sign confirmed. 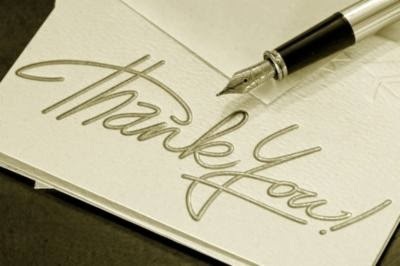 I quite believe with your conform writing (deal) as you wrote in your email that sent to me". "and if you want me myself who take you as your tour guide driver, please you contact me soonest (book me around 3 weeks earlier) and give a note about that into your email"